I recently wrote a short piece about some of the research I’ve been doing around data and datavisualization in the television industry. Read the full post on CST here. Okay, so I haven’t quite managed to hit my target of one viz a week, but 4 in 5 weeks isn’t a bad return. Without further ado, here is the fourth viz in the series (with a commentary below the screenshots / gifs). As usual, you can see the full interactive version by visiting Tableau. The viz in action. Try it for yourself! In putting together this week’s viz, I wanted to gain a bit more experience when it came to dashboard design. My previous visualisations (which you can see here, here and here), were all relatively straightforward in design terms. As I was dealing with a more complex dataset (more on this in a moment) a more elegant solution in terms of design was required. Originally I had been working on a Sankey (see image below for an example of a Sankey) to try and visualise the narrative complexity of the series. As an avid viewer of The Walking Dead, I had noticed some interesting trends in terms of the narrative design – specifically, it has become quite common to have episodes in which there are only a very small number of characters (around 2-3). In theory, a Sankey seemed like the most logical way to demonstrate this trend. However, as I worked on this viz I came to realise that the amount of data involved resulted in a rather chaotic and difficult to read visualisation. In short, it wasn’t the most effective way to communicate or explore this trend – for the record, I haven’t abandoned the Sankey altogether as it’s still a rather fun (and visually striking) way to explore the series. I’ll share this viz at some point in the next few weeks. With a Sankey viz out of the running, I began to focus on types of graphs that could instantly illustrate the narrative complexity of The Walking Dead. In data terms, this meant focusing on the number of appearances by “main” characters (i.e. those with 15 or more credits across the first six seasons). The data itself was taken from IMDb and walkingdead.wikia.com. From there, it was actually quite simple to illustrate the narrative complexity of The Walking Dead – i.e. to show which episodes has more main characters (and therefore were more likely to have more narrative threads) and those with fewer characters (and therefore have fewer narrative threads). Here was my first effort, which also included IMDb ratings in an attempt to explore any correlation between narrative complexity and episode rating. To some extent, this first attempt achieves what I had set out to do: namely to visualise the narrative complexity (i.e. number of character appearances) across the first six seasons of The Walking Dead. There even appears to be some correlation between the complexity of an episode and its IMDb rating – though this is something I plan to explore further in future visualisations. At this point, however, the viz suddenly evolved into an episode and character guide that also illustrated narrative complexity / character appearances. The final version (see first image) isn’t as straightforward as my first attempt (and lacks the IMDb dimension) but it does still convey the same idea. Looking at the viz, it’s still pretty clear which episodes contained more characters than others. Finally, to add more functionality to the viz and to broaden its appeal, I added some filters (so that users could select particular characters, seasons, or a combination of both). I also colour coded the viz by season, and added custom shapes to quickly illustrate the type of character appearance (tick = normal appearance; skull = episode in which they die; dream bubble = character appears in a hallucination / apparition; rewind = character appears in a flashback; grave with zombie hand = character is undead; film reel = character appears in archive footage; microphone = voice only appearance). Hovering over these icons reveals further information about the particular episode, including the name of the episode, the date of its original US broadcast, it’s IMDb rating and number of votes, a brief synopsis, and, where relevant, details of a character’s death. Hopefully you get some use out of this viz and/or the write up. If you have any questions or comments feel free to get in touch. For my third post in this series, I’m sharing two visualisations that are a continuation of last week’s “viz of the week” about television viewing behaviour, which is based on research conducted by Ofcom. If you want more context about this series of visualisations, I suggest you take a quick look at last week’s post. Alternatively, if you’d like to jump straight to the interactive version of this viz, you can find it here. In the last post, I briefly talked about one of the many virtues of data visualisation, namely it’s ability to draw our attention to trends (or anomalies) in large datasets – something that can’t easily be done by staring at an Excel spreadsheet. Using Ofcom data, available here, this “story” of visualisations ultimately explores trends in viewing behaviour, such as average minutes viewed during certain days of the week. Last week, I noted how visualising the data (using Tableau) allows us to quickly discover that Sunday and Wednesday are the days of the week with the highest and lowest average number of minutes viewed, respectively. However, this probably isn’t much of a surprise. Fortunately, Tableau (the software of choice for many data visualisers, or should that be “visualists”?) is incredibly flexible and allows us to change the way we look at the data with ease. We can dig deeper by quickly modifying, adding or removing parameters, changing the visualisation type, or (as is the case with the second of this week’s visualisations, below) by combining different datasets. Each colour relates to a different year (2009 to 2014). Each individual graph shows average minutes viewed for every day of the week, beginning with Monday and ending on Sunday, from 2009-2014. Viewing the data in this way tells quite a different story. On the one hand, we can see what some of the earlier visualisations in this series already confirmed – that average minutes viewed increased slightly between 2009-2012 but has since declined, with viewing in 2014 only marginally lower than 2009. What’s more interesting, perhaps, is that in 2014 Wednesday was no longer the day of the week with the lowest average minutes viewed (this honour went to Tuesdays). Given the significant difference between average minutes viewed on Tuesdays and Wednesdays over the previous five years (with the former consistently higher than the latter), this represents quite an interesting and sudden development in television viewing behaviour that would be difficult if not impossible to discern from a spreadsheet (as it would require calculating averages for each day). As such, anomalies like these can provide useful starting points for further research. In instance, we might therefore want to focus our attention on Tuesday and Wednesday television schedules in 2014 in order to try and account for this discrepancy. In this viz, the days aren’t separated into different years (as in the two visualisations above). The x-axis refers to day of the year (1-365), the y-axis is average minutes viewed, colour is day of the week and size refers to UK weather. In the fifth and final viz of this Tableau “story” (above), I combined two different datasets – (1) Ofcom viewing data and (2) government data on UK weather (the latter of which was taken from data.gov.uk). As this was my very first attempt at making a data viz, this was more of an experiment in combining different datasets, with the (rather obvious) result showing that more television is viewed during colder weather (the bigger the plot point = the hotter the weather = the lower it is on the y-axis). For my second instalment in this “viz of the week” series I want to share the first data visualisation that I made using Tableau. In many ways, it looks a lot more sophisticated than last week’s viz but was actually much easier to put together. For one thing, the data was already there (and didn’t need much in the way of restructuring) whereas last week’s viz required a lot of mining and refining (not to mention a significant amount of help from the Tableau community). A sneak preview of one in a series of visualisations which I’ll be discussing over the next couple of weeks. Isn’t she pretty? You can read about / see the first few visualisations in this series below. The main dataset for this week’s viz comes from Ofcom who regularly publish their research in easily accessible formats (i.e. csv files) under an open data licence. In this viz, I used their survey of television viewing behaviour over a five-year period between 2009-2014. As this was my very first viz, I ended up presenting the data in various ways. In doing so, I came to realise that there are a near infinite number of ways in which the same data can be visualised – and in most cases, different visualisations emphasise different aspects of the data and/or reveal different insights. The focus of this series of visualisations centred on the average number of minutes of television viewed over this five year period. In the original dataset, this information was also broken down into various other categories such as demographic, television network, etc. But for this first viz, I wanted to keep it as straightforward as possible. Even so, I had a lot of fun doing this and even stumbled across a couple of interesting and unexpected insights. As ever, you can see the full interactive version of the viz over at Tableau (it’s much more interesting as you get to “play” with the data yourself, so I’d highly recommend that you head over there). However, below there are some screenshots of the first three visualisations in this series accompanied by a brief bit of context. For the record, there are five visualisations in total in this Tableau “story”, all based on the same dataset, and I’ll be discussing the fourth a fifth ones in next week’s post. In the first viz in this series, the x-axis shows time, beginning in January of 2009 and ending in December of 2014. Meanwhile, the y-axis shows the average number of minutes viewed per day per person. Already, there are some interesting patterns that begin to emerge – none of which are that surprising to be honest. But interesting nonetheless. First and foremost we can see that, as we might expect, the average minutes viewed starts quite high (in January) but dips as we enter spring and summer, before increasing again in the autumn and winter. The UK doesn’t have “seasons” of television as clearly-defined as the US, but autumn (i.e. early to late September) is around the time that some of the most successful TV series begin broadcasting (e.g. The X Factor, The Great British Bake Off) and is one reason why average minutes begin to increase at that time of the year (more on this in next week’s post). Viewing the years side-by-side in this way shows that this is a relatively consistent pattern – an inverse arch in which average minutes viewed starts high, declines, but then increases again. However, viewing the data in this way (i.e. as consecutive years) also highlights other interesting patterns. For one thing, there’s a notable decline in average minutes viewed by the time we arrive at 2014 (although, somewhat surprisingly, it’s not that much lower than 2009). There also seems to be a much greater range of average minutes viewed between 2010-2013 as evidenced in the more equal distribution of points during that time period. Finally, I used the colour filter in Tableau to distinguish between days of the week. This creates a particularly interesting pattern in which, once again as you might expect, the average minutes viewed is generally much higher for certain days of the week (see close up screen shot below). In this instance, the pink plot points (which represent Sundays) are clearly much higher than orange (Tuesdays) or green (Wednesdays) which are consistently lower. The second viz in the series is more a less an extension of the first. It simply focuses on the days of the week which have the highest and lowest average minutes viewed – Sunday and Wednesday respectively. Of course, the flexibility and interactivity of Tableau makes it’s easy for anyone looking at the viz to set these parameters themselves (in other words, they could have done this in the first viz). However, it’s nice to have the option to tell the story yourself, in this instance by removing some of the other “data noise” (i.e. the other days of the week). In Tableau this can be achieved a couple of different ways (that I know of at least). Firstly, you can create a “story” – i.e. a sequence of visualisations which viewers can navigate between by clicking on the relevant title (which you can see highlighted in the screenshot below). The other way is to create a series of visualisations that sit side-by-side within the same canvas, using the dashboard feature. You can even do a combination of the two, i.e. a story of dashboards or a dashboard of stories! In the third viz (and the last one I’m going to discuss this week) I’ve gone back to the original viz, but instead of colour coding the days of the week, I’ve colour coded the months of the year. This final viz is effectively the same as viz 1, except that the colour coding draws our attention to a different value in the data – in this instance, the month of the year. To some extent, this is already apparent in the first viz and this was simply an experiment in design. However, looking at these two visualisations side-by-side (see below), it does become clear that the design can “coerce” or “guide” the viewer into focusing on particular aspects of the data. Personally, I’m convinced that there’s a lot of value in exploring this kind of data in visual terms. Scanning through an Excel spreadsheet can be instructive to some extent, but is far less engaging. More importantly, though, visualisations are far more effective at revealing patterns or anomalies, which themselves can provide useful starting points for further research. For instance, by focusing on the days of the week with the highest and lowest average minutes viewed (see viz 2 above) we can immediately see that there was much more overlap in 2009 and 2014, whereas in the years in between, there was quite a significant gulf in average minutes viewed between Sundays and Wednesdays. As I’ve already mentioned above, it’s probably no surprise (particular to those in the television industry) that viewing is generally higher on a Sunday, but what’s less clear is how or why this pattern has changed over time – in other words, why was there less of a gulf in viewing on Sundays and Wednesdays between 2010-2013 compared to the years before and after? Perhaps these were just anomalies, but this example still demonstrates how and why visualisations (and interactive ones in particular) can be a really useful model of research as they allow us to select, refine and compare a range of data categories with the simple press of a button. For my inaugural “viz of the week”, I want to share a visualisation that I produced whilst researching for a book that I’m currently writing which examines changes in the narrative form of US television primetime drama over the past 10-15 years. The book takes as its premise the idea that changes in narrative form — such as the development of the “real-time” hook of series such as 24 and Critical, or the emergence of what Jason Mittell has called “narrative complexity”, as evident in series such as Lost and Mr. Robot — are the result of wider changes in the production and distribution of television. For example, I argue that narratively complex serials (such as those listed above) have proliferated in recent years due in large part to the widespread availability of catch-up services such as Hulu or the BBC iPlayer, as well as the proliferation of DVRs such as TiVo and Sky+, both of which increase the range of opportunities for viewers to see all episodes of a series (and in their correct, intended order), thereby making serial storytelling a more viable option for broadcast television. To put it another way: if we miss an episode of our favourite serial drama, there are now a multitude of ways to catch up. In the case of 24, I argue that its real-time narrative is suited to and supported by its pattern of distribution. As the viz below shows, not only did UK broadcasts eventually catch-up with the US (to within a day or two – with several episodes actually simulcast, i.e. broadcast in “real-time”) but the duration of the seasons also compressed significantly (from the fourth season onwards). Screenshot of the viz made using Tableau. You can find the full interactive version on Tableau Public. Note, the large circles represent dates when two new episodes were broadcast in the same night. You can see from the viz that this practice increased over time (in both the US and UK), which enabled the broadcasters to compress the window of distribution. There’s a lot I could probably say about this viz and where it fits in to my argument, but for now I’ll leave you with an animated version of the above which plots the episodes as they were broadcast, and would encourage you to take a look at the full and interactive version of the viz at Tableau Public. If time permits, or if demand is high, I’ll do a more detailed post about the “making of” this viz with info about where I got the data, how I structured it, and what I did in Tableau. My sincerest thanks to Simon Runc for helping me put this viz together. Since my last post (almost a year ago!) I’ve been immersing myself in the exciting and new(ish) world of Big Data. 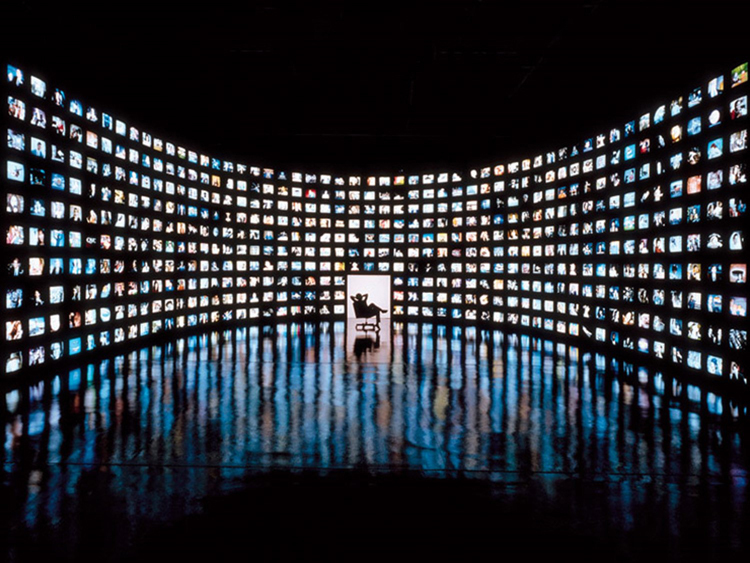 As a television scholar, I’ve been interested in the role and relevance of data within the creative industries for quite some time now, with my current research looking in particular at the relationship between television and Big Data. The phenomenal success of data-driven subscription-video-on-demand [SVOD] services such as Netflix and Amazon Prime is a testimony to the increasingly important role that data plays within the media industries. As part of the research process, I’ve been getting to grips with some of the key concepts of Big Data and the main tools used by those in the industry – the idea being that with some first-hand experience of how things actually work (rather than abstract speculation), I’ll be able to write with more authority and accuracy. One area that I’ve become fascinated with, and which seems to have become instrumental in the context of the television industry, is data visualisation – or “data viz”. It’s been a very steep learning curve, particularly for someone with very limited knowledge of programming, but has also been very rewarding. Although I’m still very much a novice, I’m excited by the research potential and pedagogical opportunities of data visualisation (I plan to write a post about the latter at some point, so watch this space). Another common approach to data viz has been to harness the databases of websites such as IMDb and Rotten Tomatoes in order to search for patterns or correlations about particular texts or groups of texts (e.g. all films made in a particular decade, all TV series starring a particular actor). These visualisations tend to focus on specific kinds of measurable data such as ratings (something I’ve written about in the past, see here and here) and often produce startling or unexpected results. This fascinating viz, for instance, enables you to make quick comparisons between the volume and average rating of films produced by different countries, with additional controls over genre, time period, and rating. Historically, it would have been difficult if not impossible to conduct research on such a large scale as this – at least, it wouldn’t have been possible to do this in the time it now takes, which is the click of just a few buttons (see below). Credit to Yu Hua Lim. Clearly, data visualisation can help us to tell stories or convey ideas (as is the case with the GoT viz above). However, as this latter example demonstrates, it can also be a useful research tool – one that can provide fascinating and unexpected new insights. My own visualisations are a bit more simplistic than the examples posted above. Neverthess, I wanted to start a “Viz of the Week” series as a way to share some of my ideas and works in progress, and to encourage (and hopefully inspire) others to explore this exciting new field of research as well. I’ll be posting a new viz each week (or monthly if my rate of previous posts is any measure of my productivity) with a short description to provide a little context for each visualisation – though I realise good visualisations should speak for themselves! Until then, feel free to comment or get in touch. The video below is an example of the kind of outsourced/open-source labour that Netflix now regularly taps. It’s taken from the most recent Netflix Hack Day – an event at which programmers demonstrate and pitch their ideas for new Netflix features. Everyone seems to be talking about the recent premiere of AMC’s Fear the Walking Dead [FTWD] – a prequel to the hugely successful graphic-novel-turned TV series, The Walking Dead [TWD] (2010 – ). This intense level of discussion is hardly surprising given the impressive viewing figures for the pilot episode, which broke two key records for a cable broadcast: highest viewing figures for a pilot episode, and highest ratings in the key 18-49 demographic. Given this success, it probably won’t come as much of a surprise that the pilot for FTWD is currently the most popular download on Pirate Bay – by quite some distance too (at the time of writing, nearly double the amount of downloads compared to the number two slot). But for all its record-breaking popularity, the reviews for the pilot have been somewhat mixed. With just a couple of days since its initial US broadcast, the episode’s rating on IMDb stands at 8.2. “Not too bad” you might be thinking, but compare that with the pilot episode for the original series, which has a much more impressive rating of 9.2, and suddenly FTWD looks somewhat underwhelming (regular readers will be familiar with my obsession with IMDb ratings). Of course, the IMDb rating for a pilot episode isn’t always an accurate measure of a series’ success or longevity. Indeed, many pilots that have similar IMDb ratings have gone on to become hugely successful series in their own right, firmly establishing their place within the canon of television history: Breaking Bad (8.3); Game of Thrones (8.3); The Wire (8.1). The Resurrection of a Dying Franchise? How the series fares in the coming weeks will be of grave concern for AMC (pun intended). Over the past couple of years, the network has seen two of its most popular and most lucrative series come to an end – Breaking Bad (2008-2013) and Mad Men (2007-2015). At the same, FTWD’s parent series, The Walking Dead, recently concluded its fifth season and appears to be running out of ideas (how many variations can there possibly be on the “is it / isn’t it a threat” formula?) Having worked so hard to establish their name in the world of quality TV, AMC therefore find themselves in a rather precarious position in which their portfolio of original programming is suddenly drying up; a position in which the risk-averse safety-net of the spin-off suddenly looks quite appealing. This set of circumstances might also explain the network’s recent decision to greenlight the Breaking Bad spin-off Better Call Saul (which, incidentally, is very, very good). 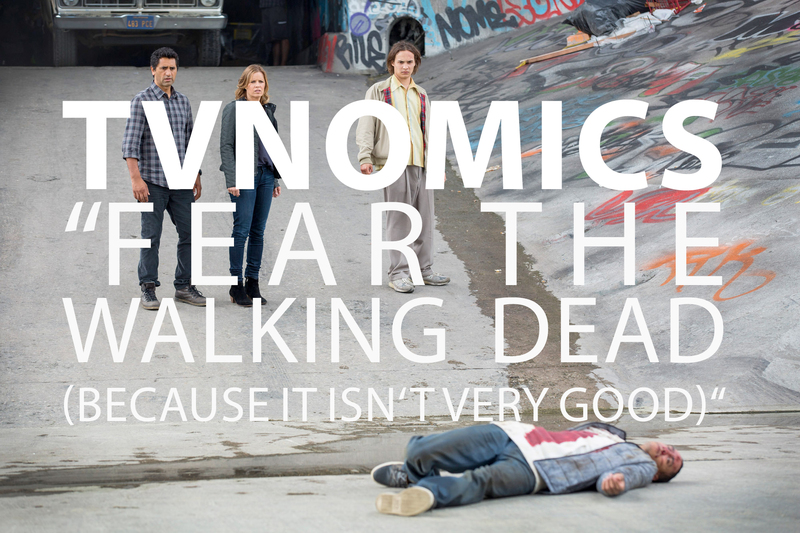 While spin-offs make sound economic sense for AMC, particularly at this critical time, FTWD feels more like a desperate attempt to rejuvenate a dying franchise rather than a decision driven by a genuine creative impulse. For me, the main problem I have with FTWD is its limited central conceit, which appears as though it will primarily focus on the events that lead up to TWD (but in a different city and with a different set of characters). This seems to lack the same kind of narrative longevity afforded by the sprawling post-apocalyptic possibilities of the original series. In short, it’s a prequel of sorts; but a prequel that will have to develop within a very limited timeframe before it eventually inhabits and overlaps with TWD. Given that TWD has nearly exhausted the narrative possibilities of this particular zombie-infested-universe, what more can FTWD really offer? Sure, it can tell the story from a different perspective, with different characters in a different location (couldn’t TWD also do this?) It might also attempt to provide more clues as to the origin of the outbreak (of which there has already been much speculation following the pilot episode of FTWD). It also opens up possibilities for cross-overs or tie-ins with the original series. The key difference, however, is that it takes place in a (slightly) different time and focuses on the gradual collapse of humanity, rather than the fallout. And this is precisely my concern for the longevity of the series – how long can this collapse really take? Is this something that can realistically be drawn out over a number of seasons? Personally, I’m not convinced that it can. However, AMC, who commissioned a 15 episode second season before the pilot episode even aired, would seem to have more faith in this franchise than I do. Ultimately though, I can’t help but see FTWD as an attempt by AMC to retain the fanbase of TWD by introducing them to a new, revamped version just in time for them to witness the death of the original. Even though I’m not the biggest fan of The Walking Dead (and especially not FTWD) I do hope that I’m wrong on this occasion. As ever, feel free to comment below. Never before in the history of television have we had so much choice. Not only is there more content than ever before, we are also spoilt for choice when it comes to how and when we choose to watch. The situation was very different during the earliest years of television when viewers only had a choice between two or three channels. This made the process of deciding what to watch relatively easy, if not somewhat limited. Over the years, however, our options have dramatically increased. Most of us have access to a vastly expanded broadcast spectrum of hundreds if not thousands of channels, as well as various free or subscription based streaming providers such as the BBC iPlayer, Hulu, Amazon Prime and Netflix. And then there are the more illicit avenues such as Pirate Bay or live streams of sporting events. Most would probably agree that this expansion of choice is a step in the right direction. Not only does it appeal to consumers who are increasingly used to having everything “on-demand”, but it also creates competition. However, too much choice can be overwhelming. John Ellis, a colleague of mine at Royal Holloway, first described this phenomenon in his book Seeing Things: Television in an Age of Uncertainty back in 2000. Whilst online television was not yet a reality at that point, Ellis coined the term “choice fatigue” to describe the increasing amount of time people spent flicking through TV stations and scrolling though electronic programme guides [EPGs] trying to decide what to watch. This problem of “choice fatigue” certainly encapsulates my relationship with television today. Luckily, Netflix seem to be aware of this issue and have designed their interface to minimise choice fatigue by minimising choice itself. Rather than displaying the entire catalogue (which varies from region to region, but is in the thousands) it uses sophisticated algorithms to push a small but tailor-made sample of its collection to the surface. Nevertheless, viewers (such as myself) can still spend (or rather, waste) a large portion of their time browsing the catalogue instead of actually streaming content. Thankfully there are a growing number of resources designed to help viewers circumvent choice fatigue. For example the website A Good Movie to Watch features a “random suggestion” generator for when you just can’t decide. The unique selling point for this particular site is that its generator only recommends films that meet its three (somewhat unusual) eligibility criteria: all films must have been released after Michael Jackson’s Thriller (1982), have a rating above 7 on IMDb AND 70% on Rotten Tomatoes, and should be “little-known”. Why Michael Jackson’s Thriller should be the cut-off point is anyone’s guess, and what actually constitutes a “little-known” film is also debatable. Regardless, sites such as these have become popular amongst more indecisive viewers – their very existence as evidence of the growing problem of “choice fatigue”. In addition to dedicated websites such as A Good Movie to Watch, there are also plenty of “top 10” lists published online on a daily basis. However, given the nature of Netflix’s ever revolving catalogue of content (with titles regularly disappearing without warning), and due to significant regional variations, these recommendations can have a very limited shelf-life and geographical relevance. Luckily, Netflix Originals are exempt from the complex digital and geographic rights that can cause other programmes to disappear without warning. As the list below only includes Netflix Originals, it should have a much longer shelf-life and geographical relevance than other lists and recommendation tools. What Makes a Netflix Original? Before I begin my list, it’s worth briefly defining what constitutes a Netflix Original. This may seem a little pedantic but Netflix have a habit of taking programmes that have been produced and/or broadcast in one territory, before rebranding and passing them off as their own in another. They’re not the only guilty party when it comes to this rather misleading practice of rebranding content. For example, the US streaming service Hulu.com have a list of “original productions” that includes Misfits (E4) and Moone Boy (Sky 1) amongst many others. In the UK, Netflix recently rebranded AMC’s Better Call Saul (2015-), a spin-off of Breaking Bad (AMC, 2008-2013) as its own “original series”. This will explain why some notable series didn’t make it onto my shortlist – UK viewers, for instance, might be wondering what happened to Better Call Saul which, for the record, is one of the best programmes on Netflix at the moment (the UK version of Netflix anyway). It’s also worth noting that the list below only includes “series” rather than films or one-off productions. Finally, and perhaps most importantly, the reviews below are not reviews in the traditional sense. Rather, in keeping with the economic, industrial and technological focus of this blog, I’ve offered some thoughts about each these series and their place within the broader context of the contemporary television industry. 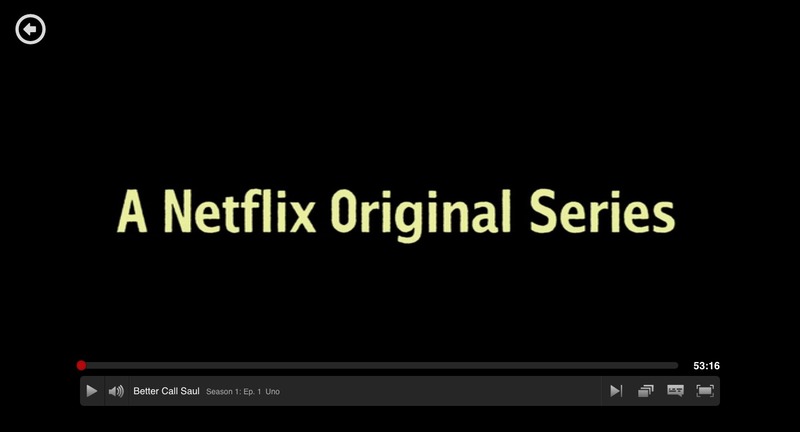 First up is one of the series that has put Netflix on the map when it comes to original productions. While it’s proven to be one of their most popular original series, Orange is the New Black is in many ways the least “Netflixy”. It’s excellent television, but is probably the most conventional series that made it on to this list. This isn’t necessarily surprising if we bear in mind that this was one of the company’s first ventures into original production – commissioned at a time when they were still relatively new in the market, and perhaps a bit more conservative with their choices. Structurally, OITNB reminds me a great deal of a number of recent major network quality dramas. Specifically, it relies heavily on flashbacks to create what is known as thematic parallelism. This is a trope that was seen most prominently in series such as Lost and is used here to great effect. 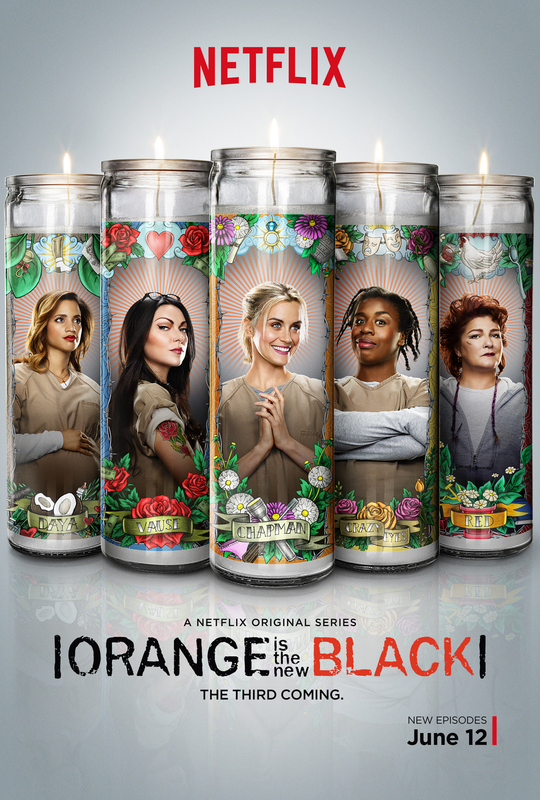 OITNB would have featured higher in my top 5 but for me its most recent third season felt a little tired. While the critical consensus was generally positive, IMDb voters seem to be less convinced. Whilst the second season had an average rating of over 8.4, this fell to just over 8.2 for the third season. Granted, this is only a very small decline in the rating, but few series seem to improve with age. A fourth season is scheduled for release in 2016. This prequel to the 2001 cult film Wet Hot American Summer is incredibly immature, but for that reason, is incredibly fun to watch. It probably helps if you’re a fan of The State (MTV, 1993-1995) where many of those involved in the original film and its prequel series first made their names (Michael Showalter, David Wane, Michael Ian Black, and Ken Marino to name just a few). It also doesn’t hurt that many of the actors that appeared in the original film, and who make their return here, have achieved varying levels of stardom (Bradley Cooper, Elizabeth Banks, Paul Rudd, Amy Poehler). For Netflix, a series such as WHAS is therefore a relatively safe bet. Not only does it feature a series of “A list” Hollywood stars, but the franchise already has a small yet dedicated cult following (read: guaranteed audience). Importantly, Netflix also has streaming rights to the original film and making-of documentary, adding further value to its existing content. A critic in The Guardian recently described Grace and Frankie as a show that “just falls short of television greatness”, likening it to an apple pie that could have been the best pie ever if only it had a dash of nutmeg. I’m not sure that I agree. Grace and Frankie is a wonderful dramedy that feels very honest, intimate and is often very moving. I don’t think it would be a spoiler to outline the basic premise (but please skip ahead to the next paragraph if you’d rather not know): two ageing lawyers (played by Martin Sheen and Sam Waterston) have been in love for the past twenty years and, wanting to take advantage of the recent legalisation of gay marriage, finally decide to come out to their wives (played by Lily Tomlin and Jane Fonda). Whilst at first they have very little in common, Tomlin and Fonda’s characters begin to see past their differences, developing an unexpected friendship based on their mutual abandonment and subsequent need for support. In many ways, the premise screams “conventional sitcom”. Two opposing characters forced together due to circumstances beyond their control: comedy ensues. However, Grace and Frankie somehow feels different to the usual major network fare. Indeed, it’s hard to imagine something as bold and daring as this being broadcast on ABC, CBS, NBC or FOX. The obvious explanation for this is the fact that major networks tend to avoid dealing with issues that polarise the nation (in this instance, gay marriage). Add to this television’s continued marginalisation of elderly audiences, and suddenly Grace and Frankie doesn’t look like an attractive prospect for major network TV. This marginalisation is largely driven by the fact that ratings are still primarily concerned with the 18-49 demographic – despite the fact that elderly audiences make up an increasingly large part of the television audience. 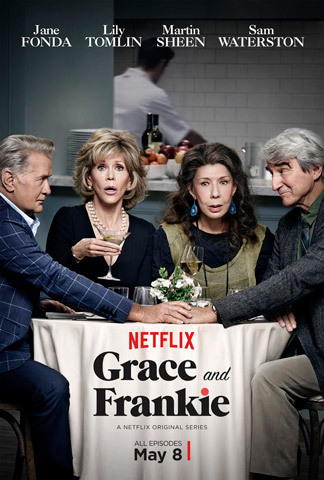 As a result of this combination of forces, Grace and Frankie has much more in common with sitcoms you might expect to find outside of the major networks (for example, the more controversial fare found on HBO or Showtime). Indeed, all of the titles that made this list have that much in common – they all seem different to “mainstream” offerings and for that reason have found a good home on Netflix. With four Primetime Emmys and two Golden Globes amongst its ever expanding trophy cabinet, House of Cards has been a significant critical success. More importantly though, the series has been an integral part of Netflix’s successful attempt to break into the already highly competitive marketplace of original television production. This was their first foray into this unknown territory. But in purchasing the exclusive rights to House of Cards, Netflix were arguably just as cold, calculated and assured as the series’ central character, Frank Underwood (played excellently by Kevin Spacey). 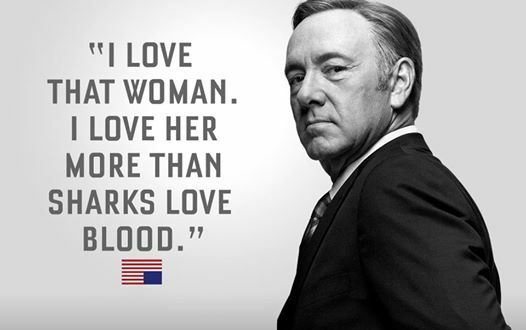 According to the company’s chief content officer Ted Sarandos, the decision to back House of Cards was heavily influenced by the vast bodies of data generated by Netflix viewers; data which suggested that the unique combination of star(s), director and genre would prove to be a winning formula. It looks like they were right. House of Cards is therefore not only notable for its significant critical success (including the accolade of being the first online-only original web series to receive a major Emmy nomination), but will also go down in history for pioneering a new economic approach to television in which “big data” is used to inform purchasing and commissioning decisions. I’m sure many will disagree — and Bloodline could well fall down my list depending on the direction it takes in its upcoming second season — but for the moment this series deservedly gets the top spot. Bloodline bears all the hallmarks of a quality television drama. It’s dark, complex, nuanced and original. It features incredible cinematography and excellent performances (from a cast that includes Sissy Spacek, Kyle Chandler, Chloë Sevigny, Sam Shepard, and the hugely talented Ben Mendelsohn). What more could you want? So far, this list has allowed me to explore a number of ways in which Original Netflix series are distinct from the rest of television (particularly major network TV). One thing I haven’t mentioned, however, is the fact that the Netflix “all-at-once” model gives us freedom over the pace at which we choose to watch. In that sense, Netflix is not only distinct from network TV, but also from the kind of basic and premium cable quality TV to which it is inevitably compared. Bloodline, perhaps more than any other title on this list, really benefits from binge viewing. Its complexity and subtlety wouldn’t be as effective within the weekly broadcast schedules of the majors, or even HBO, AMC, or any of the other cable networks. Given that Hulu recently declared their commitment to the weekly scheduling of original online content, Netflix is the probably the best home for a series as complex as Bloodline. Even Amazon Instant have shown a preference for weekly “broadcasts” (or rather streams) of original online content. As such, Bloodline highlights a fundamental difference between Netflix and the rest of this new breed of streaming services – one that may well shape the kinds of programmes it produces in the future and how we experience them. Before I incur the wrath of Dare Devil and Arrested Development fans, I should point out that I enjoyed both of those series (although Dare Devil less so) and that they only narrowly missed out on my top 5. As the slate of Netflix Originals is set to expand significantly over the next couple of years, choice fatigue will only increase. At that point, I’ll revisit this list. Until then, happy bingeing. It’s been far, far too long since my last post. I’m coming to the gradual realisation that the demands of academia don’t really allow for prolific, or even occasional blogging. As such, this post is a bit of a cheat – rather than a brand new piece it’s a link to one that I recently published at CST Online (Critical Studies in Television). You can read the full article here. This blog post is based on a recent paper I delivered at the Forgotten Television Drama conference, which took place at Royal Holloway in April 2015. Through a close examination of Netflix, it considers the increasingly important role that “big data” plays in the commissioning, marketing and delivery of television as well as the methodological problems this might pose for future media historians.